With so many services these days wanting to help you store your files online, they might all seem like the same thing. Are "online storage" services like Google Drive and Dropbox the same as "online backup" services like Backblaze? Or, as more than one person has asked me, can't you just store your files on Dropbox and call it a day? The short answer is there are significant and important differences between these types of online services, and they don't really replace each other. Here's what you need to know. Take a look at Dropbox's website summary (the descriptions listed if you search for "Dropbox"): "Dropbox is a free service that lets you bring your photos, docs, and videos anywhere and share them easily. Never email yourself a file again!" Microsoft OneDrive is similar: "Store photos and docs online. Access them from any PC, Mac or phone. Create and work together on Word, Excel or PowerPoint documents." Google Drive does mention file backup--"Get access to files anywhere through secure cloud storage and file backup for your photos, videos, files and more with Google Drive"--but the Google Drive home page highlights only these three main features: Store files, access them from other devices, and quickly share them with others. By contrast, this is Backblaze's description: "Award winning unlimited online backup for only $x/month. Backblaze automatically backs up your data to the cloud." And the Backblaze home page mentions these features: security, unlimited data backups, automation, and restoring data. Other online backup services are similar, emphasizing security and protecting your files, rather than sharing or file syncing. Some backup services also let you remotely access your files and share them from multiple devices, but that's not the main focus. While Dropbox and other online storage services' purpose is to make sure you can access individual files from multiple devices, online backup services are designed for full protection against data loss and (most importantly) recovering all of your files in case your computer is lost, stolen, or otherwise compromised. These might seem like small points, but they drive the main features of these services, and generally explain that they’re really two different tools for two different kinds of jobs. (Much like even though you can use both a wrench and a hammer to drive a nail into the wall, they're not equally designed to do the same thing.) They're also the reason why using online storage isn't the same as having true backups. For the majority of online storage services like Dropbox and Drive, you can only store a certain amount of data on their servers. Even if you pay $10 a month for 1TB of space, it might not be possible to store (or back up) everything you should save--including huge video and photo files and archived files of your work. Some storage services also limit the size of the files you can upload and the amount of data you can transfer to their services at a given time, making it more of a hassle to quickly protect all of your files. Another issue with using online storage as your main backup tool: If you start to run out of space on your computer (as happens all too often with the current trend of ever-shrinking hard drives on laptops). In this case you might have to move some files to an external drive, but then those files aren't synced or copied to Dropbox or other online storage providers (and thus they’re not backed up). By contrast, a few online backup services let you save an unlimited amount of data and have no file size limits. They're optimized for efficiently transferring huge amounts of data between your computer and the backup servers. You don't have to worry about how much space you're taking up or clear out files from your queue because everything gets backed up automatically and efficiently, including files on external drives. Dropbox and Drive are very easy to use, but you still have to manually save your files to one designated folder on your computer to get them stored on these services. For each file, it's a decision to save them there or somewhere else. Many programs create a unique folder where they save your user data; those won't be saved to the online storage space unless you change the save location to the syncing folder (and not all programs will let you do this). Online backup, on the other hand, is a set and forget situation. Once you've picked the files and folders to be backed up, you don't have to do anything else. Every important file gets saved (perhaps even ones you didn't think to create a copy of, such as files saved on your desktop), automatically and continuously backed up online. In Backblaze's case, you don't even have to select the files and folders to back up (but you can adjust the file types to save and such); the software does it for you. Most of us don't want to even think about backups. This is as easy as it gets. With all the NSA and other spying scandals brought to light recently, we all should pay close attention to our security and privacy. When you want to back up sensitive files like bank statements, tax returns, or contracts--or just don't want someone peeking at your photos--encryption is critical. Online storage services, because they're designed for quick access and sharing, aren't as secure as backup services, for whom safeguarding our data is their bread and butter. Files stored on Dropbox and Google Drive are encrypted on their servers, but they're not locally encrypted on your computer before being synced to the cloud. That means if a government agency or hacker gets access to your account (and, as you’ve probably heard, there have been security leaks and vulnerabilities before), your files will be readable to them unless you've manually encrypted these files yourself using third-party software before storing them online. If you're using online storage services solely to have a copy of your files online (e.g., you only have one computer and don't need the syncing features), the cost of that backup, on a per Gigabyte basis, is much higher than the cost of unlimited backup services. Online storage services do give you an amount of free storage (between 2GB on Dropbox to 15GB on Google Drive or OneDrive), but you'll need to pay for more space. By comparison, Backblaze is $x a month for unlimited backup space compared to $10 a month on Google Drive and Dropbox for 1TB of storage space. Just as online storage services aren't the same as online backup services, the reverse is true too. 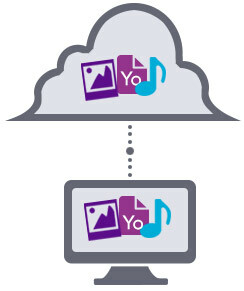 Online backup services aren't suitable for instantly accessing files on various devices and they're not collaboration tools (although, as mentioned above, you can remotely access and share individual files when you need to). In a nutshell: Online storage services are great for providing a centralized place for accessing and sharing your most needed files--for example, if you have a desktop at work and a laptop at home, plus a tablet and smartphone you want to keep in sync. They're like your file server in the sky. Online backup services are the easiest and most secure way to save all of your important files from tragedy (they can also back up your online storage folder). They're like having an IT person come around regularly (but invisibly) to back up your computer and archive your files off-site, and, if needed, save your bacon if and when your computer crashes or someone accidentally deleted a folder. As someone who was responsible for structuring the backup and file system for a small company (and now I'm the family IT person trying to keep all our computers connected and photos backed up), I really believe both are incredibly useful and necessary tools. And while they have different purposes, they play well together.